After twenty years spent mastering the art of dressmaking at couture houses in Paris, Tilly Dunnage returns to the small Australian town she was banished from as a child. She plans only to check on her ailing mother and leave. But Tilly decides to stay, and though she is still an outcast, her lush, exquisite dresses prove irresistible to the prim women of Dungatar. Through her fashion business, her friendship with Sergeant Farrat—the town’s only policeman, who harbors an unusual passion for fabrics—and a budding romance with Teddy, the local football star whose family is almost as reviled as hers, she finds a measure of grudging acceptance. But as her dresses begin to arouse competition and envy in town, causing old resentments to surface, it becomes clear that Tilly’s mind is set on a darker design: exacting revenge on those who wronged her, in the most spectacular fashion. 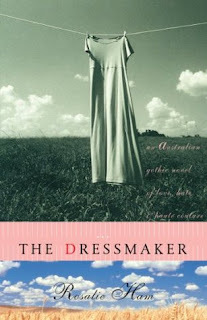 The Dressmaker will always be one of those novels that will stay with me, not only for its fascinating and hilarious plot but because all the eccentric and gothic feel to it. This made the novel so much more unique and very memorable. Watch to see more of what I thought!